We build eBooks for people to download and read on their devices: online, offline, off-grid, in bed or in the bath. Our books are built with the smallest file sizes which are standards-compliant and readable on any device*. We love websites and we love Search. Our ability to Google just about anything and get answers to our questions within just a few clicks has revolutionised the way we consume digital data and improve our knowledge. This is great news for the consumer yet the flipside is that the lives of digital content producers has become harder because we consumers do love to browse and, very rarely, will we actually stop and gorge ourselves silly. E^dition eBooks allow you to give as much content as you want to your marketplace in just one sitting. Guilt-free. An E^dition eBook from Sub@omic gives everyone the best of both worlds. Take as much or as little of the wonderful, insightful, meaningful and helpful content that you've already written into your website and publish your content as an eBook. Instead of hoping that your Customers will dutifully stay on your website to read everything, why not give them the thrill of a smash-and-grab experience? Your website visitors do not have the time to read every page on your website but they do have the time to download a file that they can read in their own time, wherever they choose to be. An E^dition eBook is written using the same quality, standards-compliant HTML that Sub@omic uses to build websites so you can be sure that, whatever digital content you need to share with your Customers, your message will get across in a format that everyone intuitively knows how to use. Your E^dition eBook makes a perfect download from your website - it's your choice if you want to make it available for free or whether you ask for contact details prior to download. However, if you're looking to find a new audience you could enter a publishing agreement with Sub@omic that permits us to publish your eBooks on Amazon and iTunes and let your content begin to earn you revenue. Drop us a quick email and let us know about the kind of eBook you'd like to publish. 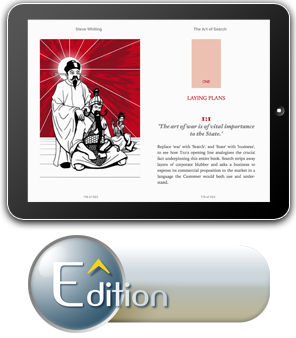 Our eBooks are written using the globally recognised and supported ePub standard. Your eBook may be read upon any digital device that can handle and display a digital file written in the ePub format. Both Amazon and Apple rely on the ePub standard for the distribution of eBooks and this means that you need not be worried about whether your target audience uses a Kindle or an iPad to read, an E^dition eBook can be read on both platforms.